Kilauea, the volcano that's been erupting on the Island of Hawaii over the past week, has already forced the evacuation of nearly 2,000 people and the destruction of more than two dozen homes. Now there's a new threat on the horizon: a violent explosion. 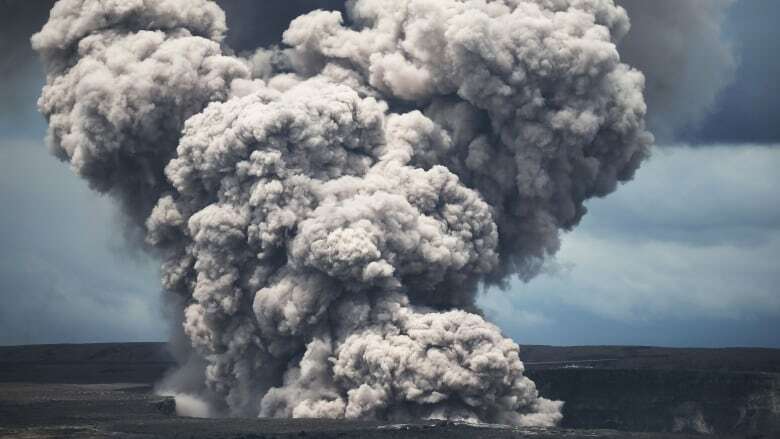 Kilauea can, however, experience more violent events as a result of something called a phreatomagmatic explosion, which occurs when searing hot magma interacts with water, sending ash and rock spewing into the sky. 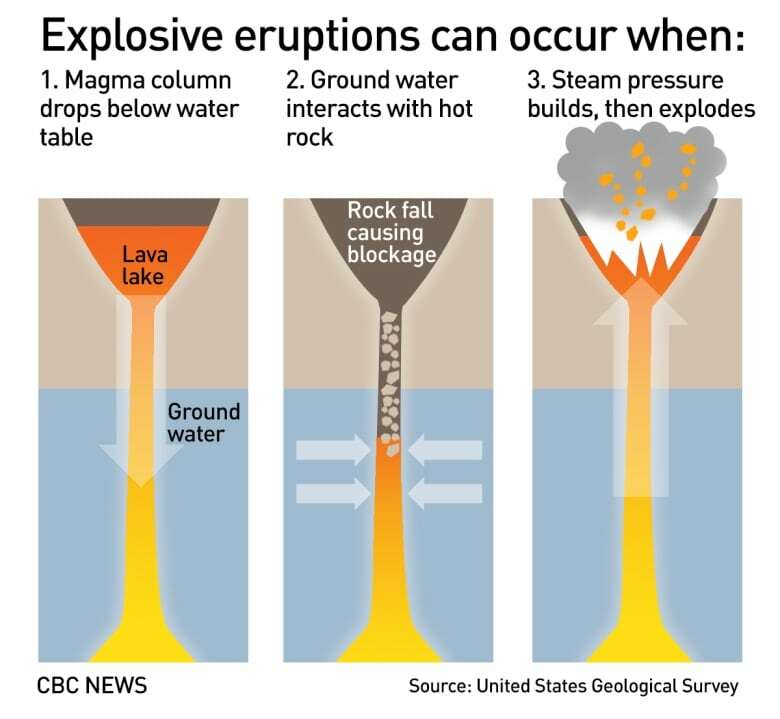 Volcanologists believe these explosions happen when a lava lake — a large volume of molten lava often contained in a crater or volcanic vent — drops and groundwater is able to seep into the resulting shaft, or lava tube. The water boils instantaneously when it comes into contact with the magma, resulting in a violent mixing of the two substances. Meantime, if rock and other sediment have fallen inward, blocking the steam that's being created, intense pressure builds up. It is eventually released through an explosion, sending extremely hot steam, rocks, gases and volcanic ash forcibly upward. The United States Geological Survey (USGS) issued an orange alert Wednesday, warning that the "steady lowering" of the lava lake in Kilauea's Overlook Crater has "raised the potential for explosive eruptions in the coming weeks." Officials with the agency wouldn't estimate the likelihood of such an explosion, but called it a "distinct possibility." Already, the volcano has been experiencing small explosions. "What we've already been seeing is that chunks of the surrounding vents are just dropping off into the lava and that's why we're getting these small explosions," said Jessica Johnson, a volcanologist at the University of East Anglia in the U.K.
"It's like when you drop a Mentos into a bottle of Coke: it starts making bubbles. 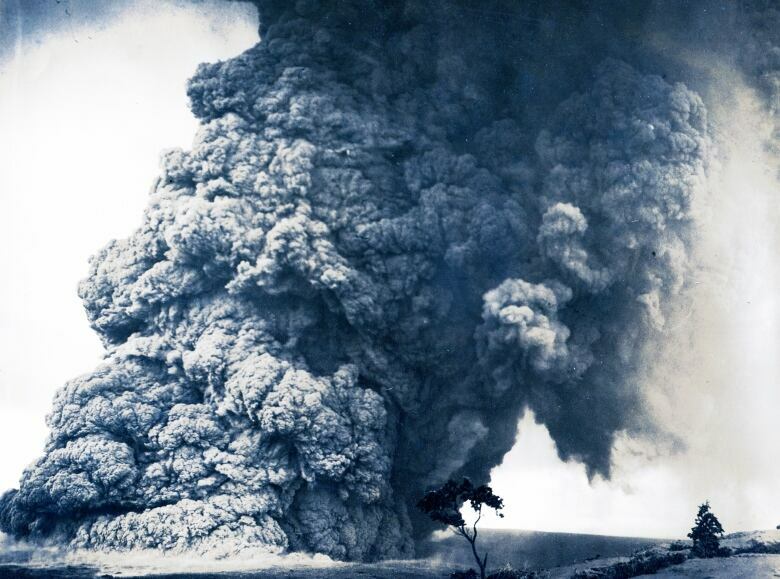 That's what's happening at the moment but these are just fairly small eruptions." Kilauea has a history of phreatomagmatic explosions. The last major one occurred in 1924 and spanned more than 2½ weeks, with more than 50 explosive events. It threw boulders as heavy as 12½ tonnes into the sky. As a result of that event, the lava lake that once existed there disappeared, though one returned in 2009. Over the past week, the Big Island has experienced more than 600 earthquakes — a sign that something is occurring deep beneath the volcano. "The earthquakes that we get at volcanoes can tell us an awful lot of what the magma is doing as it's moving through the rocks," Johnson told CBC News. "It's one of the best ways we can 'see' what's going on." While Kilauea has the potential to fire rocks and boulders into the sky, no one resides in the immediate area of the summit crater, part of Hawaii Volcanoes National Park, which was set to be closed Friday. As long as people stay away, they will be safe, Johnson said, noting that residents are likely well aware of the potential dangers while tourists may be less so. "As much as … lava itself moves slowly, there are other hazards as well, such as the gas [and] the ash," said Johnson, who previously worked at the Hawaiian Volcano Observatory at Kilauea as part of a research fellowship. People should also be cautious around the water: once lava interacts with saltwater, it produces hydrochloric acid, which is toxic. If volcanologists can better understand Kilauea and underlying reasons for its seemingly strange behaviour, Johnson said it could help them better understand other volcanoes. For example, she pointed to the fact there are two eruptions points around the volcano, where magma has a free path to rise to the surface. But it never seems to take the easy path, and instead, forces itself up through rock; 15 fissures have opened since Kilauea's vents started spraying lava on May 3. "One of the things I love about Kilauea is that it's so well-monitored and so well-studied — the more we know, the more we realize we don't know," she said.